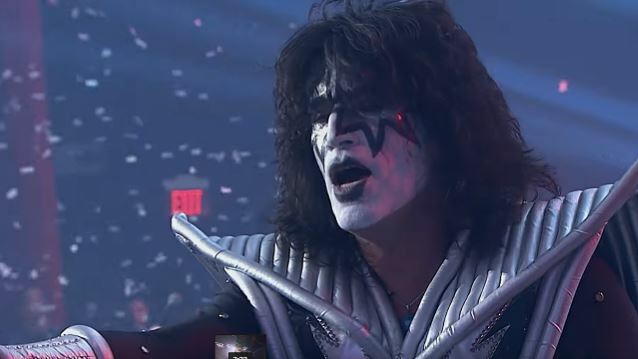 KISS guitarist Tommy Thayer spoke to CantonRep.com about whether there are any plans for the band to record a follow-up to 2012's "Monster" album. He said: "It's harder to make a decision to record a new record these days, because with all the time and effort and resources that go into doing it, in almost all cases, it doesn't pay off anymore. It becomes kind of a waste of time in a sense. Creatively, it's nice to have an outlet sometimes, but it's almost like there are more important things to spend your precious hours of the day doing." He continued: "In this day and age, there are a lot of platforms to get your music out there besides just the conventional recording business. We did this crazy KISS and Scooby Doo thing last year, and I know it's a kids' thing, but in terms of attracting new, young fans, it's astounding what things like that can do for your career. It's more about continuing think outside of the box. It's such a different world today." Thayer's comments were recently echoed by KISS frontman Paul Stanley, who said about the prospect of the band making a new album: "Well, it's a very conflicted subject. In one sense, there's no reason to put out any new music. Because the delivery systems that are available don't pay. We're in a situation now where artists have to take what they can get, as opposed to what they deserve. For me, it's more of a moral issue than anything else, because I don't have to worry about paying the rent, but what about new bands?" Stanley previously that "it's only worth [making a new studio album] if, artistically, you wanna do it. Every time we finish an album, I kind of go, 'Well, that's it.' Whenever we've done an album… When we did 'Sonic Boom', it was because the band was so good that I just thought to not capture the band and do new material would be a shame. But once we did 'Sonic Boom', I said, 'Well, we've made the point.' And then, a few years later, it was, like, 'Wow, why don't we dig deeper and get a little closer to the roots and the people that we loved and kind of do something else,' so we did that, and then I said, 'We're done.' But lately I've been thinking, yeah, we should do another." "Monster" sold 56,000 copies in the United States in its first week of release to land at position No. 3 on The Billboard 200 chart.